These wineries are full-fledged working wineries. Grapes are grown, crushed, and aged in their facilities. Our journey on the Lake County Wine Route begins on the Silverado Trail in the Napa Valley. Take Highway 128 to Pope Valley Road. This is a beautiful backroad in wine country. Continue on Butts Canyon Road and then County Road 101 to the Guenoc winery. The tasting room is spacious and the tasting room offers an extensive choice of tastings and touring options. This is the perfect spot for a wine country picnic. From the Guenoc & Langtry winery, head north on Butts Canyon Road until you get to Highway 29. Turn right and drive about six miles to Spruce Grove Road Turn right and drive another 5 miles. Six Sigma Winery specializes in small lots of varietal wines, including a wonderful Tempranillo wine. Tasting fee is free for groups of up to four. Another great spot for a wine country picnic lunch! Leave Six Sigma and head back to Highway 29 and travel to Point Lakeview Road. Turn right and head to Gregory Graham Wines. For many years Gregory Graham was the winemaker at Rombauer Vineyards. He found the ideal conditions in Lake County to start his own winery back in 2000. His winery in Lake County was completed in 2006. Today, 4500 cases are produced. Among the varietals are Zinfandel, Syrah, Grenache, Cabernet, Viognier, Sauvignon Blanc, and Riesling. After leaving Gregory Graham Wines, turn right onto Highway 29 and continue about six miles. Turn left onto Red Hill Road. In about a mile, watch for the signs pointing to Laujor Estate Winery. This is the Red Hills Appellation. Check the soil and you will see the volcanic red soil. 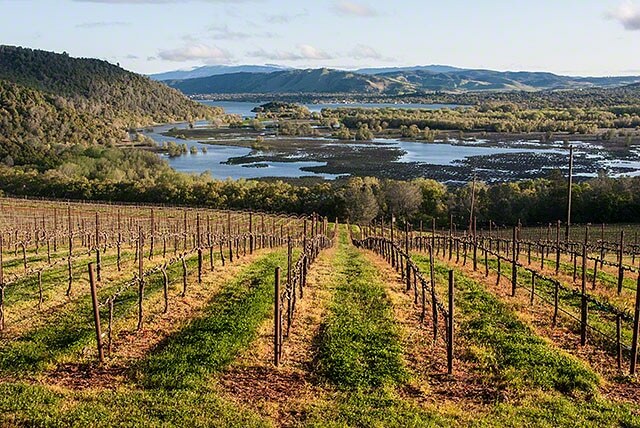 Beautiful views and delicious wines await the wine country traveler. Continue on Highway 29 towards Kelseyville. Turn right on Main Street, and then a left onto Gaddy Lane. Chacewater produces wine and olive oil. Wine country visitors can view winemaking and olive oil production, depending on the time of the year. Chacewater is a wonderful family-owned winery operation in Lake County producing small lots of very delicious wines. Pack a lunch! Brassfield is a stunning property in the High Valley wine appellation of Lake County. The bad news is that it is on the other side of Clear Lake from the above wineries. If you have the time and inclination, Brassfield is worth the visit. The wines are very good, and we think very reasonable in price for the quality. All wines are estate grown and produced. You must see the winery to believe it. Tasting Room: Tasting Room is open 11am-5pm from March 1st to November 30th. Winter Hours are 12pm-5pm from December 1st to February 28th.